Several months ago when I decided to get back to my painting, I bought a very beautiful letterpress print from an artist named Hijiri. (The texture of this print is gorgeous.) Hijiri has a shop named Heartfish Press on Etsy. To date, the print has sat on a shelf near my computer, just beside the stairway to my studio. It's a lovely reminder to keep focused on my art. Flowers are also an ongoing source of joy and inspiration. I don't know what I'd do without them. Not all parts of my garden are as beautiful or well-tended as I would like them to be at the moment, but I was still able to gather a pretty bouquet this morning. It's composed of salvia, verbena bonariensis, lavender, gaura and lemon verbena. I'm bringing this little vase up to my studio. 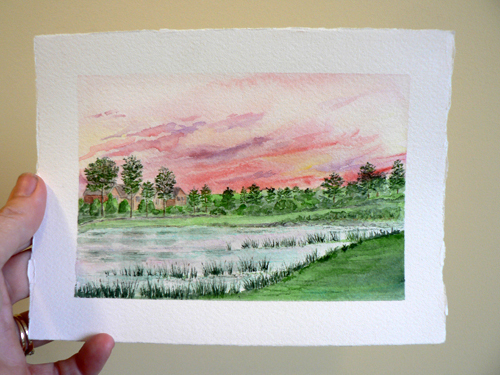 I've been working on two paintings: a sunset scene of the small lake in front of where we live and a simple painting of a stem of yarrow (achillea millefolium) that I picked from my sister's garden when I visited her this summer. 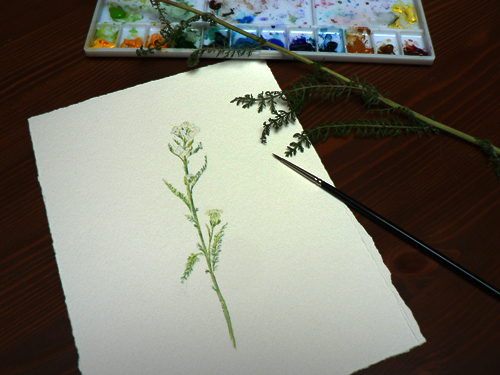 I picked a stem of yarrow from my own garden yesterday to use as a reference for the finishing details. As for my printing headaches, I found a man with a lovely soothing voice on YouTube (someone said he sounds like Harrison Ford) who explains how to manually calibrate a monitor with the brand of calibrator I own. I was relying on the automatic settings which may have been affecting my print output. 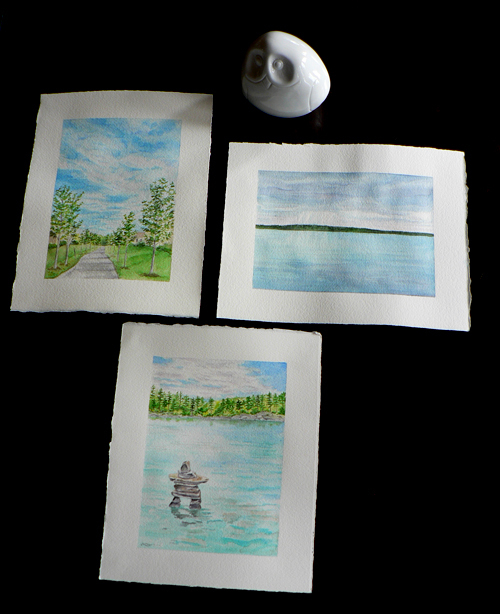 I am planning to scan a number of my paintings in the days ahead to make prints for an arts & crafts show that takes place in Dorval from October 13-16th*. I'm hoping that the technology gods will smile down on me and everything will come together. (You mere mortals can send your positive thoughts my way too.) There's a good possibility that I might also rely on some advice from my in-house Photoshop wizards, those two clever daughters of mine. *For those who live in the Montreal area, the arts & crafts show is called Boîte de Noël. It is a juried show that has been held annually since 1977. I've been a participant for at least the past 16 years. The women who run it put a huge amount of time and energy into it. The whole show is set up like a boutique. It's at the Royal St-Lawrence Yacht Club at 1350 Bord du Lac in Dorval on October 13 (6 p.m. to 9 p.m.), October 14 (10 a.m. to 9 p.m.), October 15 (10 a.m. - 5:00 p.m.) and October 16 (11:00 a.m. - 4:00 p.m.). My cards and prints (fingers crossed) will be there. 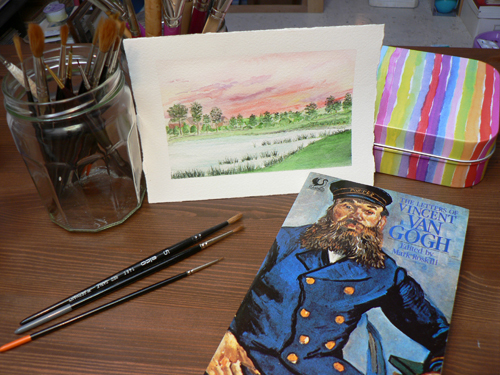 Yesterday's printing difficulties unleashed a wave of uncertainty and self-doubt that went way beyond printing and sometime during the night got mixed up and attached to painting and blogging as well--in the end, you name it. Some kind and sensitive words this morning from my dear friend Colette and my sister Nancy helped. An encouraging email from my husband was appreciated: "Ne te décourage pas!" 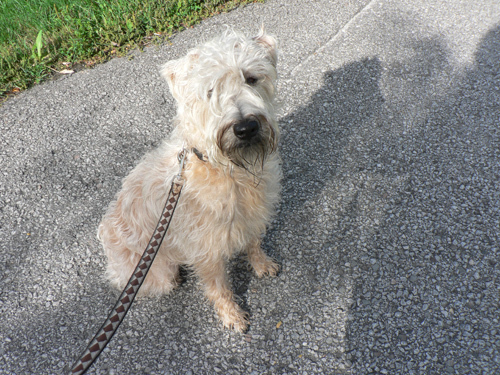 A walk with my cheerful companion Meeko was uplifting. Finally I did what I should have done hours before. I walked upstairs to my studio and started painting again. I have a quote by Vincent Van Gogh hanging on the bulletin board beside my work table. It is so simple and yet so true: "If you hear a voice within you say 'you cannot paint,' then by all means paint, and that voice will be silenced." I should have remembered Vincent's words in the early morning hours. My studio is in a state of, let's say, semi-disorder. I cleaned and organized my painting table last week so it is looking quite good. The rest of the room--not so great. There are piles and piles of books, papers, art supplies and sewing materials all waiting to be organized and placed properly. Up until this summer, I was using one of our basement rooms as a storage room for my greeting cards (I'll show you them some day soon), business papers and the bulkier art supplies. That space is now an entertainment room for the family which makes so much more sense, but that means that many things have travelled up the stairs to my studio. It also means that I'm not certain where many things are. After painting for a while today, I started looking for something I needed and I had to sift through some of the piles on my loft floor. I came across a sheet that I had forgotten about. It was passed out by the teacher of an art class I took a few years ago. Interesting timing. 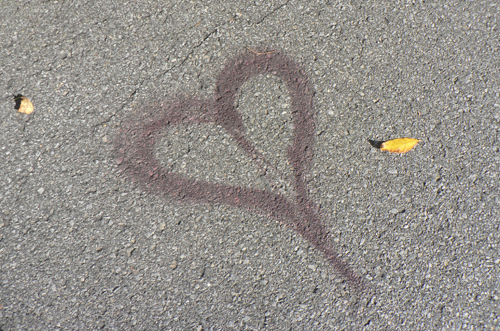 It was yet another message encouraging creativity in moments of self-doubt. I have looked it up and those beautiful words belong to the American dancer/choreographer, Martha Graham. They were part of a private conversation she had with her friend and fellow dancer and choreographer Agnes de Mille. De Mille later included the conversation in her book, Dance to the Piper. 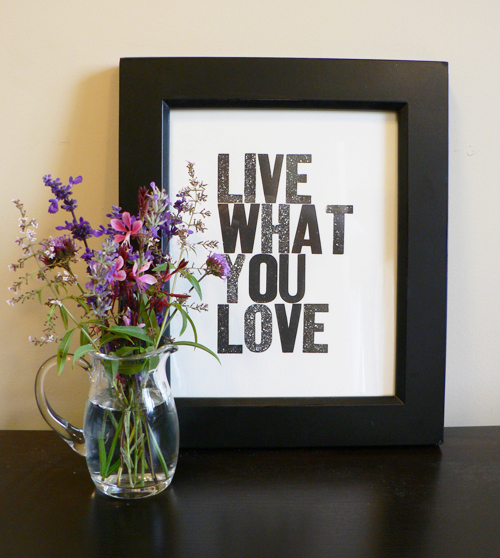 And so right now, I am taking both Vincent's and Martha's words to heart and heading back to my loft to paint. We all have them. The bad days when nothing seems to go right. Today was one for me. I have a bad cold which doesn't help things but I have a lot of work to do in the next few weeks. So today I decided to work again on converting one of my paintings into a digital print. Did you ever read the Charlie Brown comics or maybe you watched one of their shows? 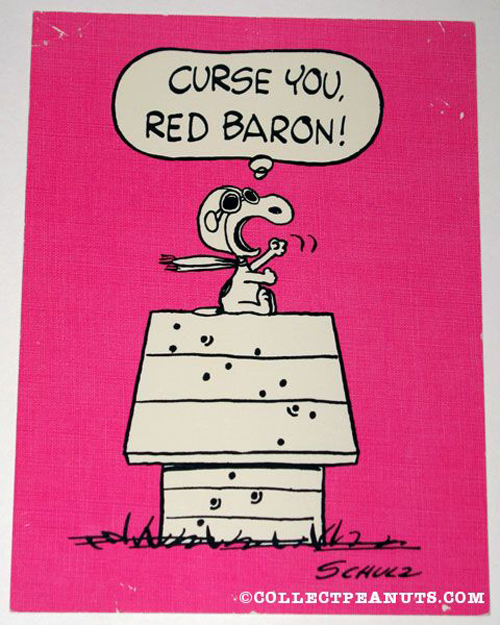 Do you remember how Snoopy's arch enemy was the Red Baron? He would engage in battles with his WW1 flying adversary and more often than not the engagements would end with Snoopy's dog house riddled with bullet holes and Snoopy shaking his fist at the sky shouting, "Curse you, Red Baron!" 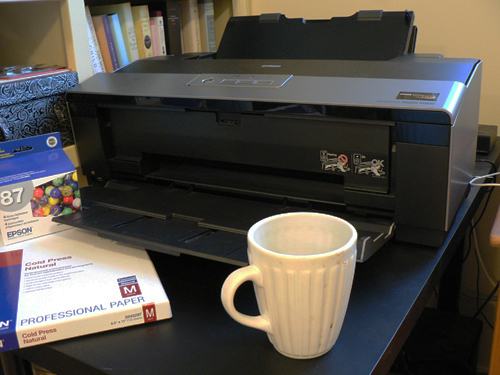 I bought my Epson printer in the spring with visions of quickly mastering the whole process of making digital prints. Dreams are lovely aren't they? I had a good scanner, a good computer and now I had a great printer. I thought it would be simple. The only problem is that they all need to work together. I have spent so many hours trying to get them to do just that. I have read manuals, online articles and consulted a number of people. I have a binder filled with tips, instructions and recommendations. I ended up buying new software for my scanner which allows me more precise control. I bought a calibrator for my computer monitor so that the colours are true. I have bought the right ink and several kinds of expensive paper. I purchased the full version of Photoshop. Photoshop and I have also had a rocky start to our relationship together. In the past, I've been pretty quick to learn new software and have often had an intuitive sense of how to do things. With Photoshop, it's like I'm in a foreign country or more like on an alien planet. I've taken some online tutorials and had some lessons from a few people in my circle and am very slowly starting to feel my way around it. 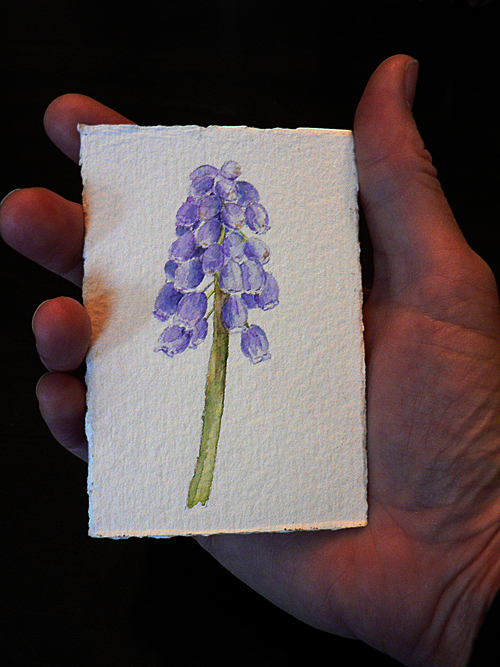 I have started by choosing a flower painting I like very much to convert into my first print. I haven't shown this particular painting to you yet. I tend to paint in a detailed way with delicate colours and this painting, once scanned, has required a lot of time getting the colours right and making sure that the image's white background was clean. This afternoon as I sat trying to make some final adjustments to get the image on my screen looking more like my original, I spilled coffee on my painting. I am so lucky that it did not hit the center of the painting. It hit the border. I rushed to the sink to rinse it off but the coffee stain is still there. It won't show in the prints and I think I will be able to trim the sides of my painting but I felt so sad and discouraged at that moment. I could feel the tears starting to come. When I finally got to the point of printing my image, I initially got the message that my printer did not exist. (Was it perhaps wishful thinking on my part?) When the image finally did successfully go through the printer, the colours were much darker than they were in the Photoshop image. This has been the ongoing problem with my test print runs. I'll think I've made progress and then I'm back to square one. Oh Snoopy, I know how you feel. My eldest daughter saw my tearful state and sat down with me and patiently and kindly manipulated the Photoshop image (changing colours here, saturation levels there). In the end, what we did was make the image on the screen lighter to compensate for the darkening effect of the printer. She then suggested gently that I go for a walk with Meeko. 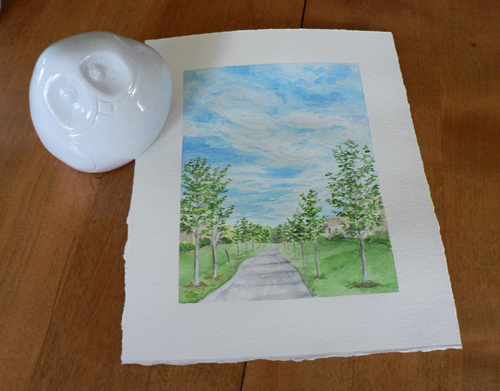 When I returned she had successfully printed an image that looks remarkably like my painting. I won't show it to you today, but I will soon. For the moment, I'm very thankful for the help I received today and have a teensy bit of hope that I am getting a closer to my digital print goals. Despite having a brain which is foggy with a cold, I decided to paint today. 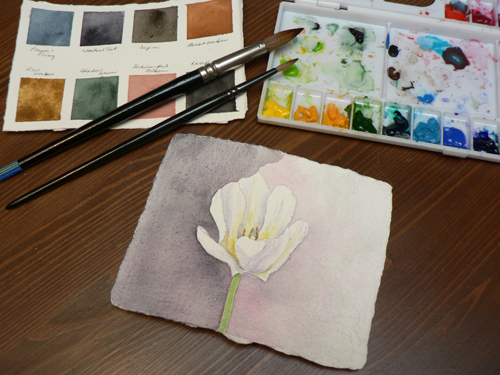 In August I posted a photo of a tulip painting that was in progress. Today, I took a deep breath and might have even made a little internal scream as I went much darker with my background (the photo above shows half of the initial dark wash). The darker background gave me the incentive to go back into the flower and add more detail and darken the shadows. I have to admit that I was inspired by the gorgeous night bird painting posted by Geninne this weekend with its inky black background. I used Winsor & Newton's 'neutral tint' with some 'winsor violet and 'perylene maroon'. I didn't go absolutely black as I wanted some of the colours of my previous washes to show. Here's the final outcome. I am much happier with it now. 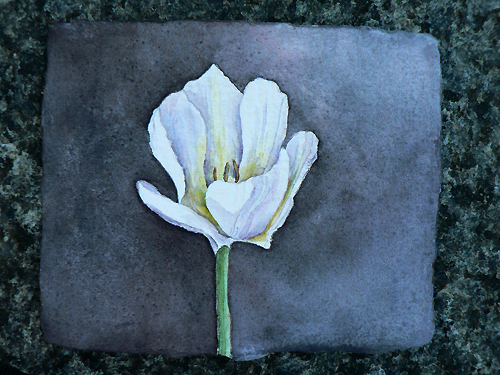 White flowers can be very tricky to paint but I now feel that there is depth to my flower that was missing before. Holy moly, me oh my...I am almost up to 1,000 page views of my blog as I write this. How incredibly exciting. Thank you to everyone who comes and visits my pages. Your presence is so very appreciated! 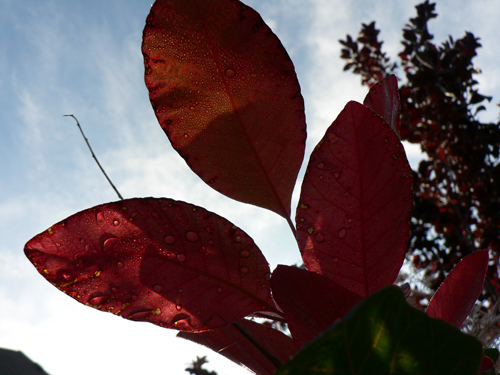 Autumn began at 5:05 a.m. today. Happy autumn! I found a quote I like very much a few weeks ago. You may have noticed it in my 'Favourite Quotes' section. Inspired by this quote, I walked around my garden this morning and took some photos to make this first-day-of-autumn mosaic. I have lots of projects in the weeks ahead. I am preparing for an October arts & crafts show that I have been doing for the past sixteen years. I'll post details soon. I am also working towards opening an Etsy shop to sell prints of my paintings. Lots to do. Lots of butterflies in my stomach. I hope that you all have exciting projects too. 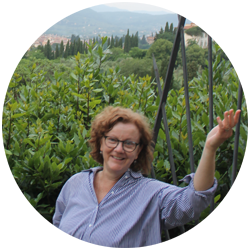 I've hijacked Kathleen's blog today. I think I am far more interesting than paintings and flowers. I mean--look at me! I understand that blogging can be cathartic and I could use a bit of that. I've been really quite good during the past few months, but a combination of recent events is changing that. First of all, I celebrated my 18-month birthday last Friday. I can feel my puppyhood slipping away. I've been told by many people that by the time I'm two, I'll be acting in a mature and calm way. That just makes me want to make these next six months count. Also, I can feel the seasons changing and it's exciting. I mean really exciting. There are new smells in the air and it's making me feel edgy and just a bit crazy. And, oh yes, two of my owners went back to school almost three weeks ago and I am really missing them during the day. Some people, when they are dealing with too much emotion and change, well apparently they eat. It's kind of like that for me, except that I eat things. This morning, she got up at 5:00 a.m. because she couldn't sleep. She started cleaning everywhere to make sure there was nothing left on the floor or on the furniture for me to take. Since her clean sweep of the place, I have swiped a box of eye drops (I am really tall when I stand on my hind legs so I can reach things in high places), I squished myself into the tiny space between the back of the sofa and the wall just for fun (I haven't done that since I was a few months old! ), I chewed on the corner of a wicker chair, I took one of the girls' art papers, I flipped through, actually ripped through, the L.L. Bean autumn catalogue (by the way, the flannel shirts look delicious this year) and it's only 9:22 a.m.! Got to go. Kathleen is about to take me for yet another long walk. She's muttering something about needing to exhaust me. I don't know what's wrong with her. She's looking a bit tired herself. 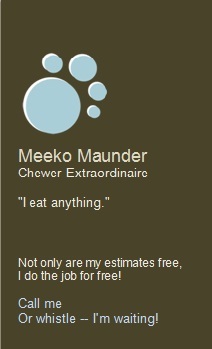 As for me, I'm having the time of my life and I'm thinking of expanding my services. I love the rain. 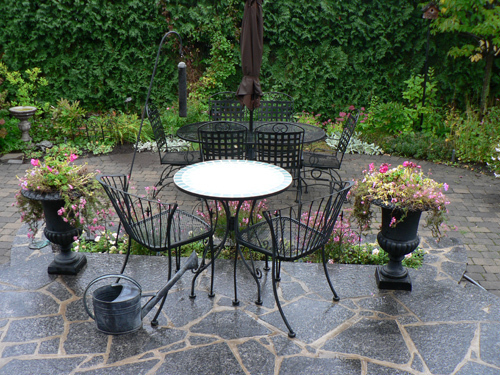 I love the quiet elegance of my garden when it is drenched with rain--the dark gray pavers, the black earth, the subdued contrast between the plants. 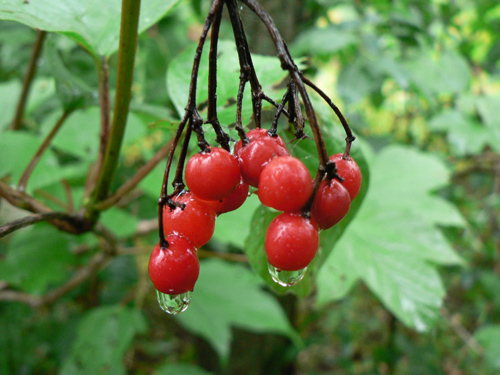 Rain is also associated with childhood memories. When I smell the rain-soaked earth, I think of camping trips when I was young as it rained so often when we were on family holidays. I walk in the rain. I garden in the rain. Probably the only time I don't like it is when it is rainy and very, very cold. When I walk with Meeko on rainy days, the walks are more intimate. I am less likely to see as many fellow walkers. And, especially on the days with hard rain, when I do pass someone, there's often a nod, an unspoken camaraderie. Flowers & Paris. I'm not sure that I can think of a better or more beautiful combination of things. This is an image from the the Parisian 'Marché aux fleurs' on Île de la Cité. This particular market has existed in this spot since 1808. My heart beats faster when I visit this flower market. I have been working today on finishing the details of this painting. This is the stage of the painting process where I can start to feel like I am going a little insane. 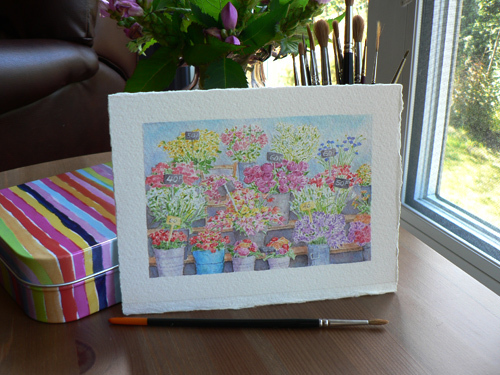 There is a lot of detail in my flowers and knowing when to stop can be a tricky thing. I will think that I'm finished and then I will notice one more small thing that needs to be adjusted. I think I'm close to being done. Above is what I consider to be a little bowl of 'happy'. It's a small dish that I have in my front hallway filled with little, pretty things that make me happy. 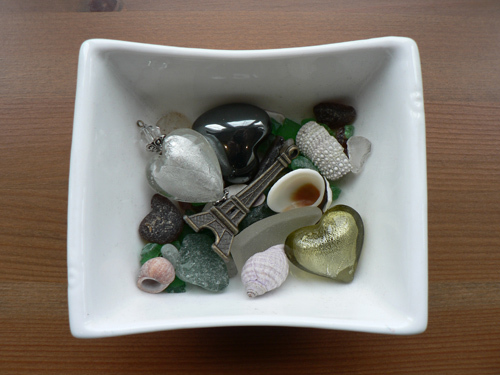 There are glass hearts, an Eiffel Tower, beach glass, tiny shells and little stones. It never looks quite the same. Something might be taken out or put back in. I have noticed visitors (kids especially) sifting through it with their fingers. My sister Nancy (who designs beautiful jewelry that I wear it most days) made a comment this week that she can sense happiness in my paintings lately. (Thanks, Nance. Your ongoing encouragement means so much to me.) I am feeling happy lately. Painting more often, moving forward in a creative direction, starting this blog (which serves the artist and writer in me)--they're all helping me to feel happy and right in my world. I've actually caught myself singing out loud a few times lately. I also made progress yesterday on making a digital print of one of my paintings. This has been a real struggle for me with a huge learning curve attached to it. I am really looking forward to being able to show it to you in the very near future. So here's my wish for you, my readers -- that you find your own little bowl of 'happy' in the days ahead, whether it be by creating something or doing something you enjoy or being with people you love. I have also been working on my Pathway painting, adding details here and there. I wonder if you can see the difference? 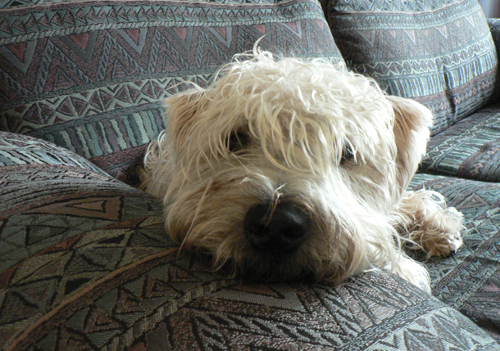 It is a grey and rainy day here, but I'm about to brave the elements, as my fluffy, four-legged friend doesn't mind any kind of weather. We're off for a rainy walk. We may even walk along the pathway. A beautiful summer bouquet I saw on the Bookhou site today (Arounna's post on 14.9.11) inspired me to go out into my garden and pick some flowers. With just over a week to go in summer (autumn starts at 5:05 a.m. on September 23rd this year), we need to get outside or bring a little of it indoors. The flower I cut today is a late blooming perennial I love. It's not seen in lots of gardens which I think is a good thing. 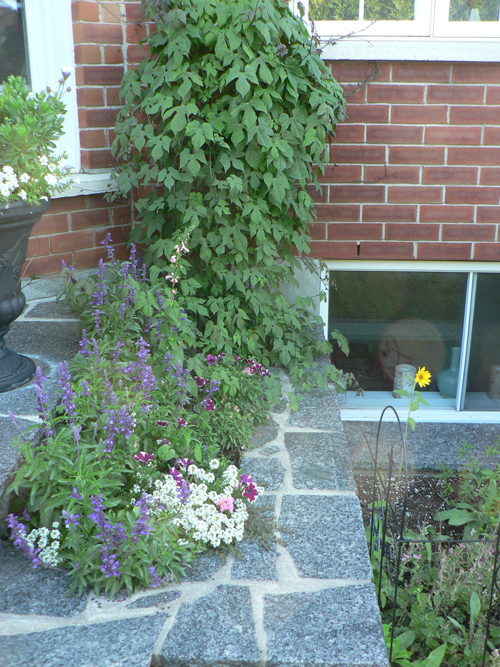 Who wants their garden to look exactly like the neighbour's? 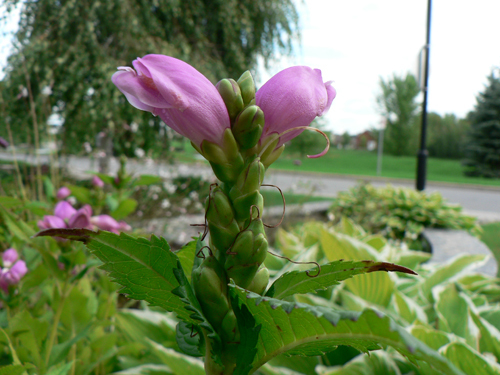 It has a wonderful, whimsical name--turtlehead. If you look closely at the flowers, you can see why. 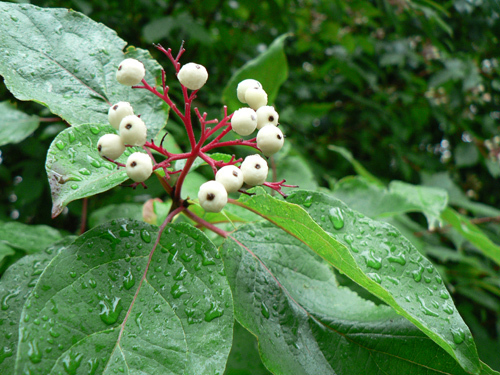 The botanical name is chelone obliqua. If you plant young nursery seedlings, space them according to their adult width and be patient. Chelone obliqua can take a few years to fill into a lovely clump but it is worth the wait. One other wonderful quality is that it can grow and flower in semi-shade or even full shade. 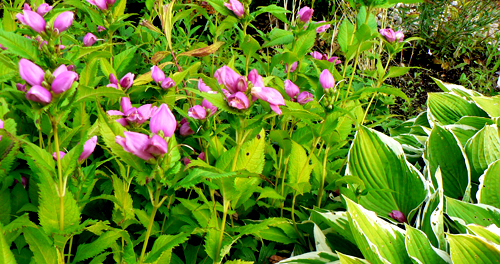 I have some planted out in the front of my garden behind some hostas (a lovely marriage). I also planted a small clump beside a staircase and behind a shrub where they get no direct sunlight (I can see them from my living room window) and they are quite content. Some people tend to give up on their gardens once the school year starts in September and the weather starts to get cool. Don't. I'm all for enjoying gardens as long as possible, right up until the arrival of a four-letter word that begins with 's'. 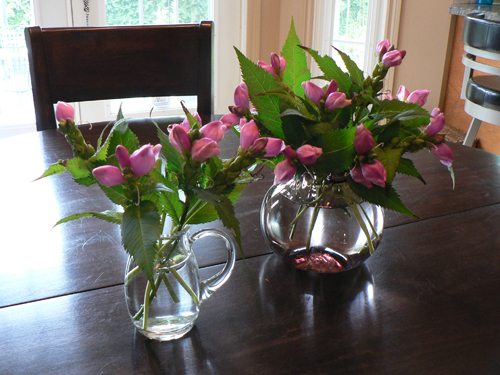 I cut two bouquets this morning--one for my kitchen table and the other to go upstairs in my studio. I cut the stems relatively short, just down to the next set of leaves where buds are already forming for more flowers. Their floral display is nowhere near to being over. They will continue to look beautiful even as the days and nights get progressively cooler in the weeks ahead. Here's the most recent painting that I have been working on. It's of a pathway I walk on quite regularly with my dog Meeko. It is based on one of the photos I took last week. 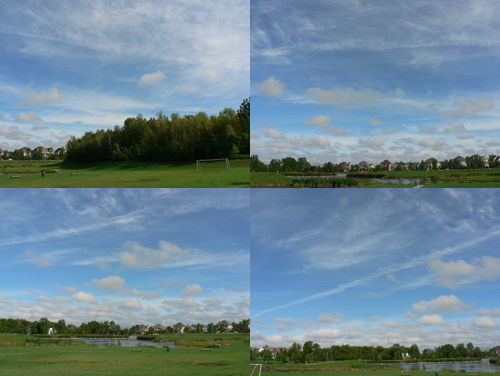 There were impossibly wispy cloud formations that day. It felt like a bit of a jigsaw puzzle trying to convey them with paint. The good news is that my family immediately recognized the subject of my painting. They knew exactly where it was. Here are the paintings from the past week grouped together. I don't usually sign them until I know definitely that they are finished. As you can see, I'm still thinking. So is Mr. Wise Owl. I'm finding it a little more difficult than I imagined to post pictures of my paintings in my blog. It feels a bit like when I've taken painting classes in the past and we all had to put our pictures up at the front of the room for a class critique, except in this case I'm never really sure who my classmates are. :) I have butterflies in my stomach each time. I really want to thank all who have discovered my blog. I appreciate you coming here. Thanks especially to those who have taken the time to write a comment. It's been just over a month since I started my blog and it's been good for me in so many ways. This morning was cold but beautiful. Six degrees Celsius (just under 43 Fahrenheit) at 7:00 a.m. Brrrrrr. The chill was a reminder to cherish these last weeks of the growing season. 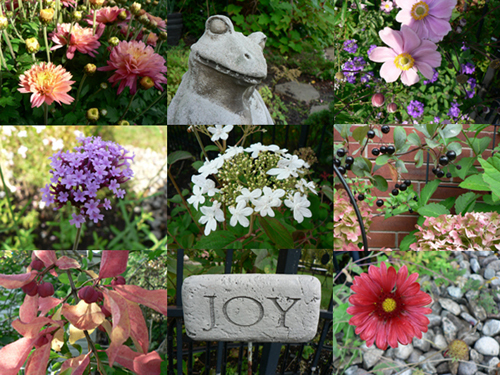 Here are a few photos from this morning's walk around my garden. The scene above is one of my favourite parts of my garden at the moment. It reminds me of 'something old, something new, something borrowed, something blue'. 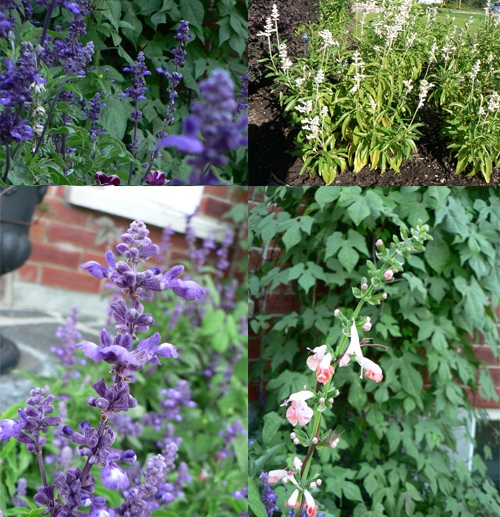 I planted some of the annuals this summer (the blue salvia, petunias and alyssum). Others have grown back from seed deposited last year (the snapdragons, the coral salvia and the big vine in the background--spanish flag). The lovely, lonely sunflower to the right was a gift from a bird. Salvia is without a doubt one of my favourite annuals. It is both elegant and hardy. It will still look beautiful right until the end of October in my Zone 5 garden. Coral salvia (salvia coccinea 'coral nymph') is particularly stunning. I occasionally find the coral plants in garden centres here in the spring or you can order the seed online. This particular plant popped up from seed deposited in the flowerbed last year. Lucky me. 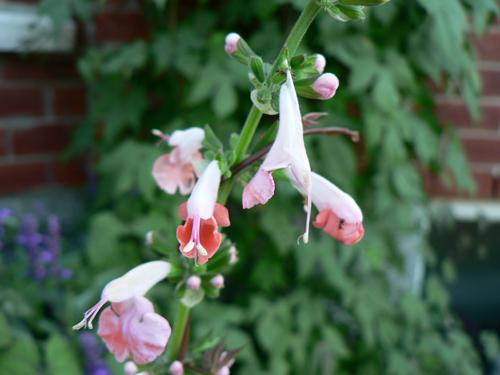 I find white salvia (salvia farinacea) to be very useful in the garden. I often use it in my front yard flowerbeds as it combines beautifully with any colour. Another beautiful benefit of salvia is that hummingbirds love it. 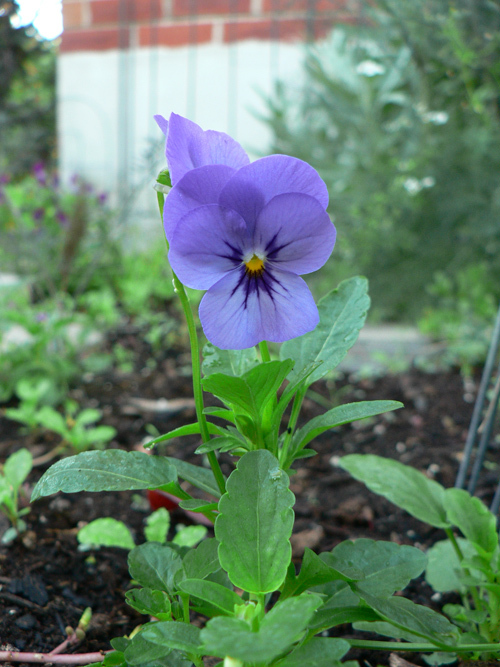 And the final image I leave you from my walk around the garden this morning is this sweet little viola. It is so rare to find blue tones in flowers. This beauty is what I would call periwinkle or lavender-blue which happens to be my favourite colour. Just a brief postscript. As I've been writing my post this morning, the radio has been reminding me that this is the 10th anniversary of 9/11. My husband was scheduled to fly to New York for a business meeting on the 12th (in the financial district but not the towers), so missed being there by a day. We were lucky. 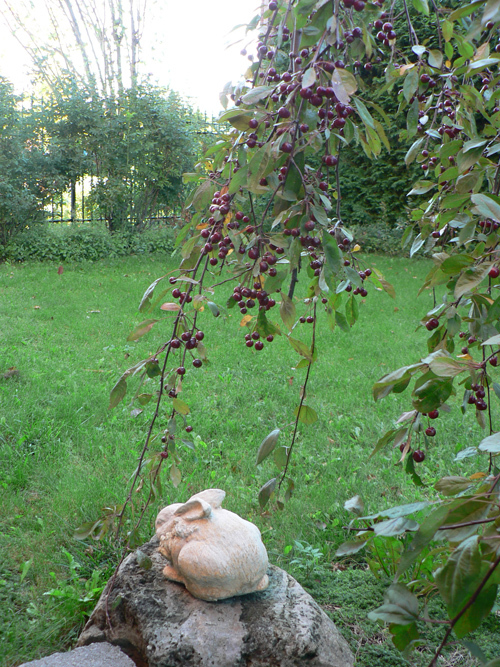 I remember how very important my garden was to me in those unsettled days after that terrible event. A garden can be a source of solace, restoration and hope on the darkest days. I planted more spring bulbs that fall than I had in a very long time. Those bulbs provided work for my hands and hope for my heart. My thoughts go out to all touched by that horrendous event ten years ago today. 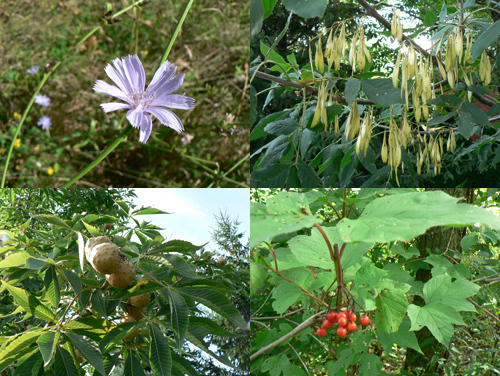 I also got some lovely shots of wildflowers, seed pods, chestnuts and berries. We are very lucky to live in a picturesque suburban neighbourhood but both Geninne and Margie I think would make the point that there is beauty in every backyard and neighbourhood. My morning walk also brought me some unexpected sights. Yes, indeed. Can you spell S-N-A-K-E? Eeeeek! I am not fond of snakes. That is a polite way of saying that I hate them. In the end, it seemed as frightened of Meeko and me as I was of it. 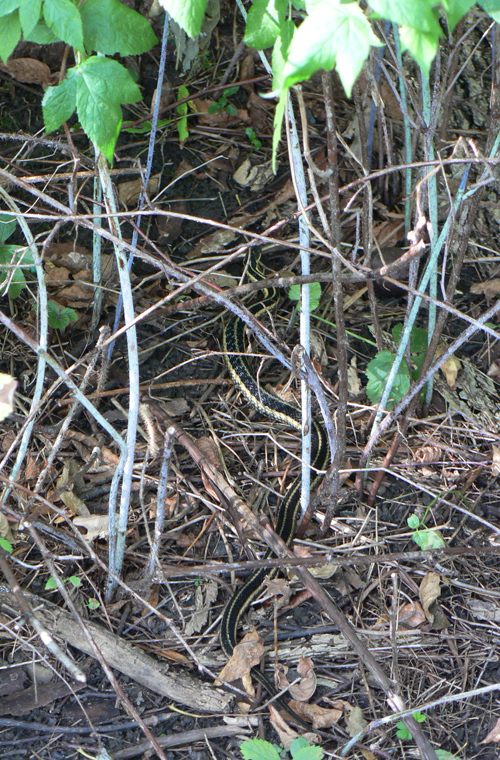 It slid off the path and then remained stationary--perhaps hoping that we would pass by quickly. Meeko was unfazed. Brave? I'm not even sure that he noticed it. I was still shuddering when we were well past it. I even shuddered when I was looking at the photo on my computer. I'm shuddering again right now. And it was an interesting role reversal for Meeko. Usually he's the one tugging me to allow him to stop and sniff. Today, I was the one tugging him and asking him to stop as I saw scene after beautiful scene that deserved to be photographed in my very own neighbourhood. 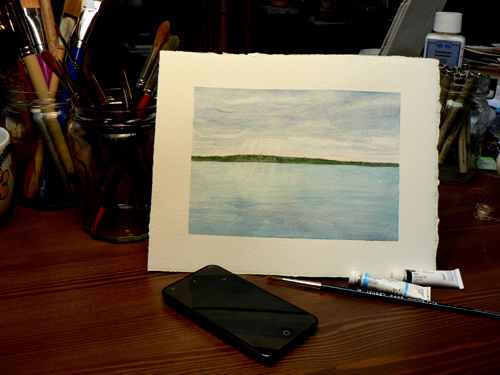 As I continued working on my Muskoka morning sunrise painting today, I had my beloved iPod Touch playing. I think it may be wrong to love an object as much as I love that sweet rectangular music box. There are some days when Shuffle can send you the weirdest, most disconcerting choices (let's say, for instance, the chorus of Hawksley Workman's Addicted as you are driving your daughter somewhere) and others when it can be in absolutely perfect sync with what you are doing. Today was one of those perfect sync days. Oh Leonard, your lyrics and sense of timing are beautiful. See a video of Leonard Cohen singing Anthem here. 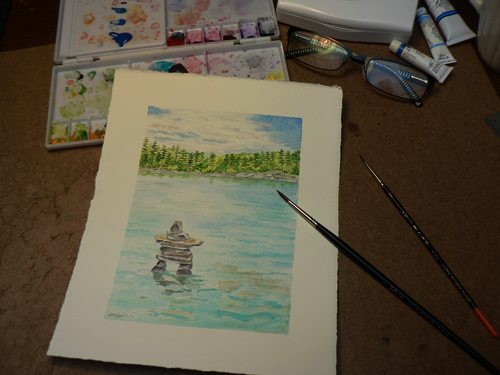 Today I painted another scene from my cottage vacation. It is a morning scene. We had very changeable weather when we were away. This particular morning, the clouds were dark and low. I was sitting on the dock thinking that it might not be the nicest day when all of a sudden rays of sunlight broke through the clouds near the horizon. A very pretty moment. 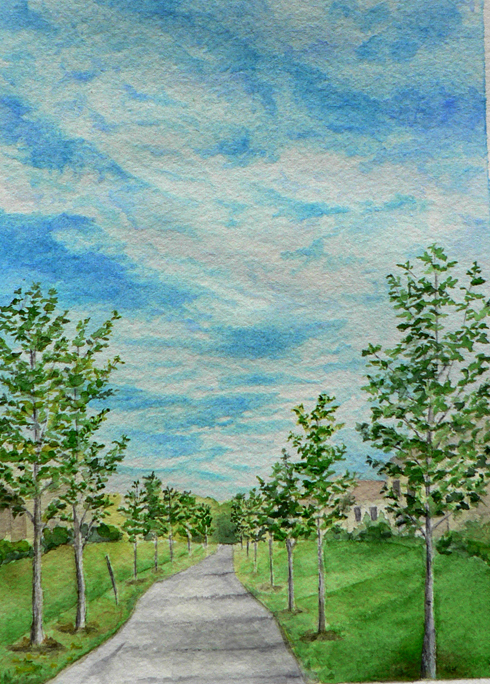 I have always loved clouds and enjoy painting them although they can be challenging. It can be difficult to convey drama, contrast and softness all at once. 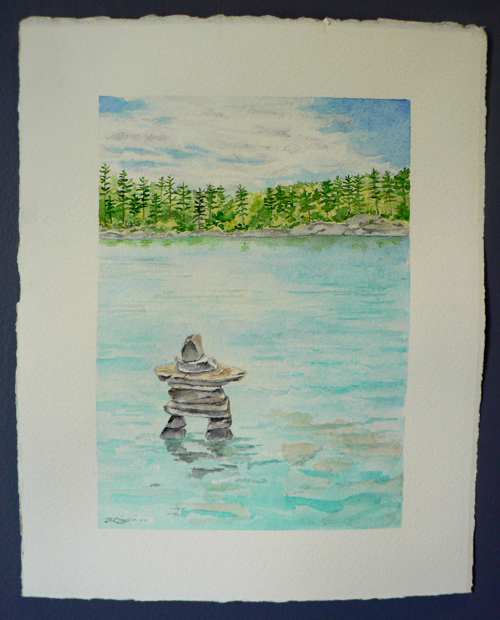 I also worked on my Inuksuk painting today. It wasn't quite finished after all. 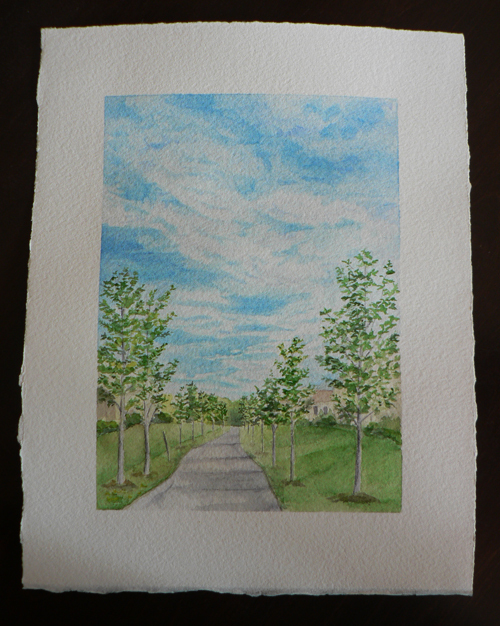 I added little more detail in the trees and clouds. I'll post the final version in the days ahead. This weekend, I started a job I didn't really intend to do in the garden. I've already written about how I haven't devoted the normal amount of time to my garden this year. The beds still need major weeding. Instead of doing that, I started pulling out the weeds in between the stone pavers on the walkway and patio in our backyard. This is not a small task, as the pathway leads from the front gate into the backyard and the patio itself is wide. As I was doing it, I started thinking that maybe I was doing things backwards. Shouldn't I get the flower beds looking beautiful and then worry about the pavers if I had time? It sort of felt like dusting before you've picked up things around the house. Oh well--once I had started, I felt committed. It took hours but I don't regret it at all (except for some aching muscles). It's like I've put a nice clean, mat around a busy painting. The whole garden looks better and I can breathe more easily when I'm walking through it. 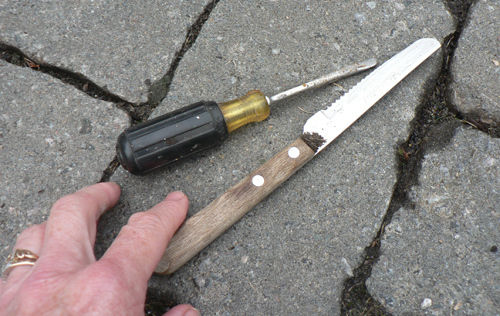 I've bought fancy tools in the past to deal with weeding between pavers, but I always come back to my tried and true tools for the job--a worn screw driver and an old kitchen paring knife. The screw driver is useful for gently rocking the pavers apart to extract stubborn roots. The paring knife slides down easily between the pavers to slice and remove weeds and to neatly edge the lawn where it meets the pathway and patio. And then there are those other indispensable tools--my hands. My nails and knuckles are looking a little worse for wear today (I'm terrible about not wearing gloves when I should) but they can be proud of a job well done. Last week, we spent a restful week in the Muskoka region of Ontario. 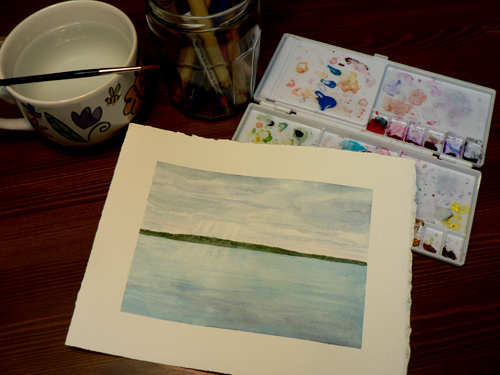 I started a painting yesterday of a scene I saw when we hiked around a lovely trail on Hardy Lake. Someone had made an inuksuk (also spelled inukshuk), a stacked-stone navigational landmark with a human form, on the shore just off the trail we were walking on. I love the way it looks like the inuksuk is admiring the landscape. For those of you who aren't familiar with the Muskoka region, it is an area of gentle landmarks and soft contours. There are no mountains and few rugged rockscapes. While this sameness could seem monotonous, the effect is actually one of calm and peacefulness. It's a lovely region full of beautiful lakes and is worth visiting. I think my painting is finished but it always takes me a few days to know. I need to stare at it at different times of day to know if I need to add any small details or shadows. Usually, I will start another painting while I am considering the 'finished' state of my last one. Here is another view. The colours of my painting are a little more delicate than what is showing in the photos. September 1st. A day attached to so many changes and new beginnings. Today, my youngest daughter begins high school. (In Quebec, high school is from Grade 7 to Grade 11.) My eldest is now in Grade 11. I'm sure that my youngest had butterflies in her stomach as she waited for the bus this morning. I will admit to having some in mine too. I know that she will do beautifully, but it is a big change all the same. Now I have longer days to concentrate on my own pursuits. I am more determined than ever to get my art career back on track. I need to make sure that I am spending time each day in my studio. I also need to allow myself computer time to continue learning Photoshop (the beast!) and to get more comfortable scanning and making digital prints of my paintings. I have long lists of things in my head that I want to do. But, most important, I just need to paint. When I started this blog, part of my thinking was that it would keep gentle pressure on me to stay focused on my painting. A while ago, I read about husband and wife musicians who worked at home on their farm. They began each day by 'walking to work'. What a good idea! It's a way of physically signalling that the work day is about to begin. At home, it is so easy to become distracted and sometimes, in a creative sense, paralysed. 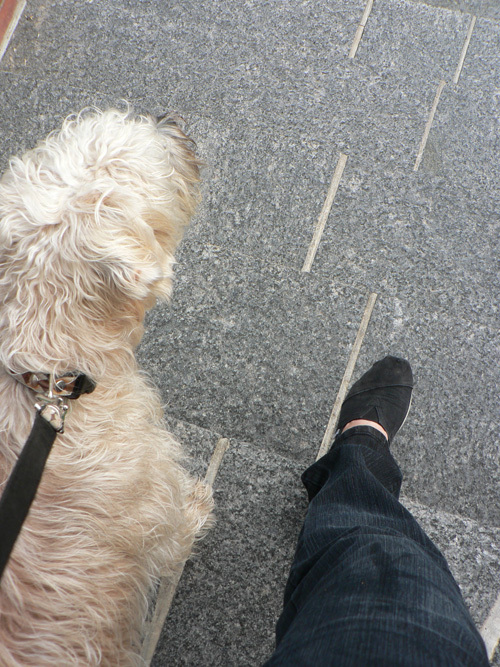 So my faithful companion and I began our day today by 'walking to work'. And now, with my cup of coffee in hand, I am walking upstairs to my studio. Wish me luck. I hope to let you see some paintings I am working on in the days ahead.